So you have loaded up your backpack, you’re stocked up with food and water, you know you to set up your tent and you’re all set for a hike and camping excursion. Don’t forget, however, that even the hardiest and most intrepid adventurer will need to stop and rest periodically – you’ll achieve nothing by pushing yourself beyond the limits of your body’s comfort. The idea of perching on a rock or on the ground beneath a shaded tree may seem appealing on paper but it’s going to take a toll on your bones sooner or later – without even factoring in weather conditions that that could leave you cold, wet and miserable below the waist. To this end, it’s well worth investigating camping chairs to add to your itinerary – and as always, we have you covered with a selection of recommendations. As always when weighing up a purchase pertaining to camping, you’ll need to factor portability and weight into your decision – nobody wants to hike through the woods with a plush armchair strapped to their back, as comfortable as that may be. However you’ll also want something that’s suitably comfortable and offers the appropriate lumbar support, as a chair that leaves your back and shoulders’ aching is no use to anybody who is planning on walking for a prolonged period of time. Of course, you’ll also want waterproof furniture – if you’re going to get a soggy fanny from placing yourself in a chair, you may as well save yourself a few dollars and just sit on the damp ground. Also, ensure that’s your chair is stable – tipping over whilst planted on uneven ground due to a sharp and unexpected gust of wind may make for an amusing photo opportunity for your fellow campers, but it’ll get old pretty quickly for you. ​What Will You Be Using It For? 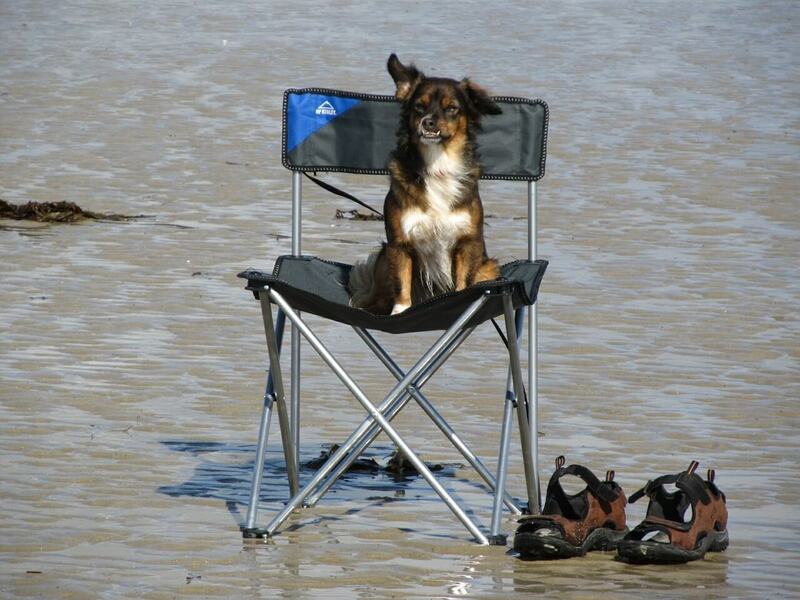 Next, consider what you will be doing whilst seated in your camping chair of choice. If it’s purely to take a load off your feet and sip on a drink while enjoying the scenery the dimensions will presumably not be of any concern (provided they accommodate your size) – all you’ll really need is a cup holder. If you also plan to sit at a fold-up camping table and eat or play cards with your fellow travelers, however, you’ll need to ensure that the chair is of an appropriate height – though of course a small, personal folding table may be a suitable alternative if it’s just for your own use. You may wish to consider an adjustable seat, especially if numerous campers will be sharing it, as everybody has different requirements in terms of legroom and height. Price points vary wildly, from cheap and cheerful canvas chairs that can be tossed in the garbage upon your return to more costly equivalents that you plan on using time and again for regular jaunts into the country – if it’s the latter you’re interested in, just check exactly how much maintenance the chair will require. Will it rust in the rain? Will the fabric tear easily and require regular re-upholstering? If that’s the case, you’ll need to look a little deeper into the quality of the item in question to avoid any future frustrations. 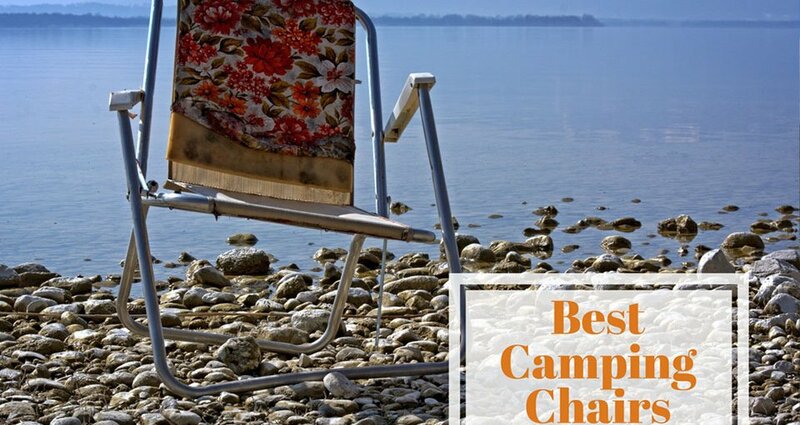 Without further ado, let’s take a look at five of the finest camping chairs that are currently easily sourced online – as always, these items have been tried and tested by everyday campers just like you, and have been shown to perform the necessary tasks required by such a product. For sheer basic functionality in a camping chair, you really don’t need to look beyond this model from Kijaro. Available in ten different colors, the polyester chair comes with net pouches on each arm to accommodate drinks and cellphones, and the Dual Lock technology will prevent the chair from sagging once you’re sat down upon it. Weighing in at 9.5lb you obviously won’t want it strapped into your back, but it comes with a carry bag and handle, and the superior polyester material will not tear easily. 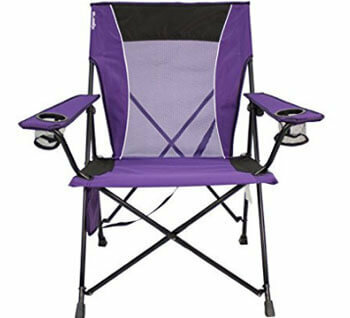 PROS – One of the most comfortable camping chairs on the market, the seat is 22” wide and can withstand weights of up to 300lb. They’re a little taller than many rival camping chairs too, meaning that anybody with long legs will not be seated with their knees around their ears. CONS – As previously intimated, almost 10lbs is a little weightier than some people may be looking to carry during a backpacking trip. Some users have suggested that this chair isn’t built to last, with key elements starting to give way after a few uses. If it’s comfort you seek however, maybe you should really push the boat out and pick up one of these padded recliners. Adjustable to up to three different seating positions, padded and roomy throughout and complete with a headrest, the dimensions and qualities of the chair do not lead to an excessive carrying weight – packed with a bag, this chair weighs in at under 5lbs. PROS – When you’ve been sleeping on the ground and trekking through the woods, you deserve a little luxury – that is something that this recliner offers in spades. Roomy and comfortable, as well as light to carry, this is well worth looking into. 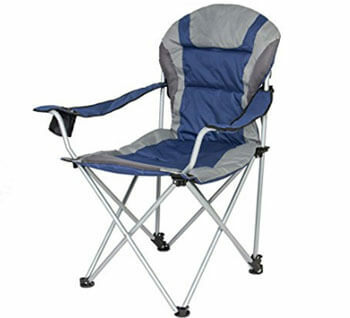 CONS – The opposite of most camping chairs – this product is really designed for taller users, possibly over 6 feet, as the metal bars may be uncomfortable for anybody shorter. Considering the chair costs quite a bit, that could be disappointing. Embrace your inner Spielberg with this folding director’s chair, available in red or black. Coming complete with a retractable side table that makes dining that much easier, this chair supports a weight of up to 300lb, is hugely wide for increased comfort, and being constructed from lightweight aluminum means that a weight of 7lb is a small price to pay for a comfortable seat. You’ll be hard pressed to find anything of similar quality and still get change from $50 – this chair is a winner. 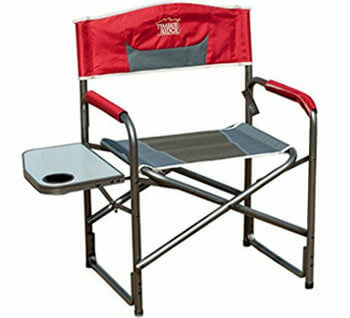 PROS – The Timber Ridge Aluminum Portable Director's Folding Chair covers just about every base you can wish for – it’s comfortable, it’s (comparatively) light, if offers great support to your back and neck, and the side table is a great bonus. CONS – This chair folds in half rather than into a smaller unit, so it’s a little more cumbersome to carry. Sometimes you simply don’t have the capacity to carry anything extra on your camping trip once you’ve loaded up a tent, sleeping bags and backpacks. 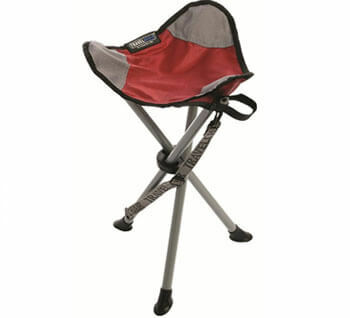 These camping stools are the perfect solution for such situations. Sitting around a foot and a half from the ground and shrinking down to an almost invisible size when not in use, you won’t get any back support from these stools but they are the perfect way to accommodate the occasional rest break without having to sit on the ground. PROS – Shrinking to the size of a newspaper and weighing just 2.2lb, this is the perfect solution for anybody who values portability above all else. CONS – If you have an existing back problem, or even just prefer to have your back supported, a stool will be of no use to you. 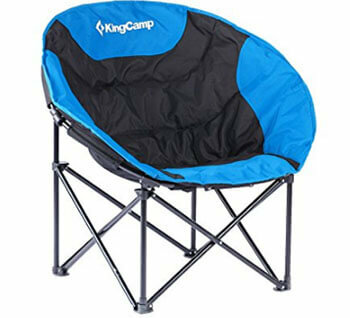 Perfectly round in order to accommodate any body shape up to 250lb and loaded with cushions and padding on all sides, you may struggle to find a more comfortable seat that then the KingCamp Moon Saucer Camping Chair. It’s a little lower to the ground than some of the other models that we have described and you’ll have to recline back to fully feel the benefit, but in doing so you’ll feel like you are floating on a cloud – just the tonic for an aching body. PROS – Overwhelmingly comfortable and easy to set up, and although it weighs a little under 10lb, the carrying case packaged with the chair makes it easy to transport. CONS – Some people may prefer a slightly higher position when seated.